Believe it or not, my current job was gained off the back of a small web development project, which then turned into a full marketing project before I was invited to stay on permanently! My company’s website was originally hand-coded by our graphic designer (the talented Tayler from Blindspot Design), but, as the company had started to grow, my boss was finding it difficult to manually edit and add new pages, so he arranged for a GO Wales participant (me) to migrate the content and design over to a Content Management System. For this, we decided to use Drupal Gardens by Acquia. For those who haven’t heard of it, Drupal Gardens is a managed Drupal hosting service. This post outlines my experiences of using the service to build, launch and manage a medium-sized website. No need to worry about server/database configurations, load balancing or software upgrades – it’s all managed on your behalf. WYSIWYG design editor – simply click on an element, define the properties (colour, background, border, position) and the CSS is written for you. Fully extendable – you can override CSS properties and specify new classes, and plugins such as jQuery, Typekit web fonts and Google Analytics are fully supported. Built-in social sharing tools – again, you can bring your own if you want to do so. If you ever want to migrate to self-hosted Drupal, you can easily export the site in its entirety and host it elsewhere – free of charge. Fantastic FAQs, documentation and community forums for support and advice. There is also less flexibility on Drupal plugins – many popular ones (and some custom-built options) are available, but requesting additional plugins is a slow process – you’re at the mercy of their to-do-list, which I’m told is rather long! Likewise, the original CSS files for the base theme can’t be edited, which means that you sometimes have to do a bit of hackery if you want to remove/significantly alter the behaviour of a theme. It’s not currently possible to import Drupal themes (even ones created using Drupal Gardens), but they’re working on it. Native e-commerce functionality is still in the pipeline, but alternative solutions include Cashie Commerce and E-junkie (we use the latter because our needs are simple and we’d prefer to pay a monthly fee rather than commission). My brief for LexAble’s website was somewhat unusual; I had to migrate an existing hand-coded site over to Drupal Gardens, preserving both content and design.Often a new website means a complete overhaul, but as I was on a time-limited work experience placement this wasn’t an option. To achieve this migration, I chose a theme that was the best match for what I needed to achieve, then using the in-built WYSIWYG editor I slowly tweaked the colours, layout and functionality until it was nearly identical to the original website. One hurdle that I faced was the fiddliness of selecting the correct element to edit, but this was easily overcome by enabling the ‘power theming‘ option. The images below show the original site, the theme in its unedited state and how the website looks now. This is the Theme (Kenwood) that I used as a base for my design. After I had got the appearance sorted, I started the process of migrating the content and functionality. This was for the most part a case of copy & paste, with a few adjustments to the HTML and CSS along the way. The most difficult part was getting the appearance of forms just right, which was made more complex because of existing CSS that was hard to override. The LexAble website as it looks now. Total time taken for entire project: 40 hours (again, not including planning, writing and time spent in meetings). Managing a Drupal Gardens site is much like managing any Drupal site, and it will be a familiar experience to anyone who has used WordPress, Joomla and other CMS. Adding a new page is as simple as pressing the ‘add content’ button, giving it a name and URL then creating the content. If you pay for a Professional subscription or above, you also get access to SEO tools such as Open Graph, keywords (which are mostly pointless these days) and Google crawler settings, all of which can be edited on a per-page basis. Compared to self-hosted Drupal, there’s a lot less maintenance – small upgrades to security and functionality and the latest stable Drupal release are done automatically. Notice is given before each upgrade, and any downtime is either minimal (2 or 3 minutes) or non-existent. As a marketing professional, the handling of all the backend stuff is money well spent, allowing me to focus on improving the site and its content. For LexAble, Drupal Gardens is ideal. It takes away 90% of the hassle involved in managing a Drupal site, but there is great potential for customisation and extending functionality. For someone like me, who has excellent HTML/CSS skills but struggles with MySQL databases and server configuration, it’s ideal. At every stage of the process I felt able to do things my own way, and I was constantly surprised by all the extra touches that the Drupal Gardens team had added in. Another great benefit is that it’s always being improved – for instance they’ve recently added the ability to make your site’s design responsive, which is a must for every website these days. There are a few drawbacks and quirks to Drupal Gardens, but none that can’t be overcome or worked around. And when I did get stuck, the Drupal Gardens team were only too happy to help! All in all, I would highly recommend Drupal Gardens to individuals or small businesses who want a professional, modern website but don’t have the time, resources or ability to manage the backend stuff. Their prices are probably a little higher than your current web host, but the customer service and behind the scenes stuff is worth paying for. 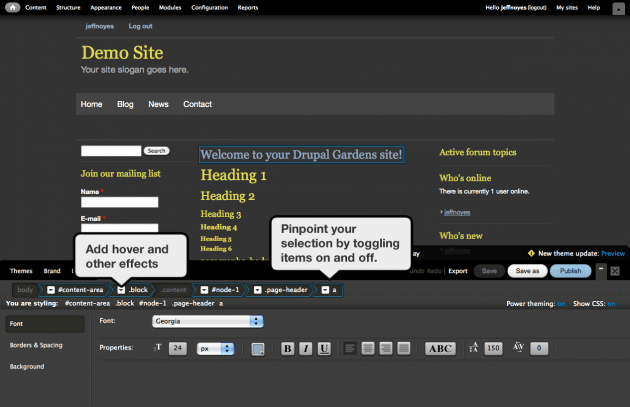 Have you used Drupal Gardens, or a similar solution? What are the positives and negatives of this approach? Let me know in the comments. Disclaimer: I have not received any tangible reward, financial or otherwise, from Drupal Gardens, Acqiua or anyone else for writing this post. Although if they’re reading this, I do quite like chocolate!